Recently, we put together an analysis of developed lots in the St. Louis region, which encompasses St. Louis city and St. Louis, Jefferson, St. Charles, St. Clair, Madison, Franklin, Warren, Lincoln, and Monroe counties. We compiled this analysis into a summary worksheet titled “A, B, C Developed Lot Activity Levels" that we are sharing with you today. 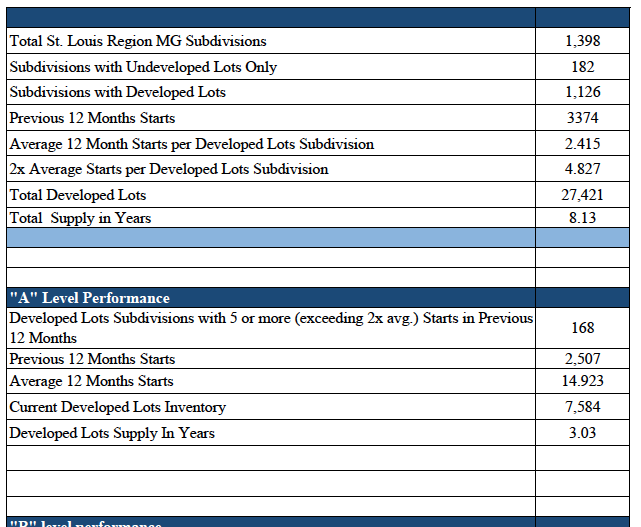 The worksheet includes data on the total number of St. Louis region subdivisions and developed/undeveloped lots. Subdivisions are separated into "A" Level, "B" Level, "C" Level, and "D" Level performance ratings based on starts (determined by foundation excavation) in the last 12 months. Though the worksheet does not contain grading or valuation criteria, it is a great way to group and review lots by these levels of activity. This is an interesting way to look at how the market is changing and how lot counts are being affected by performance.